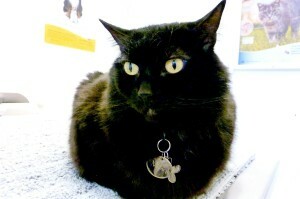 , Midnight had been the only hospital cat until “Nanu” came along. It has always been a challenge to keep her weight down, as she loves treats from clients. 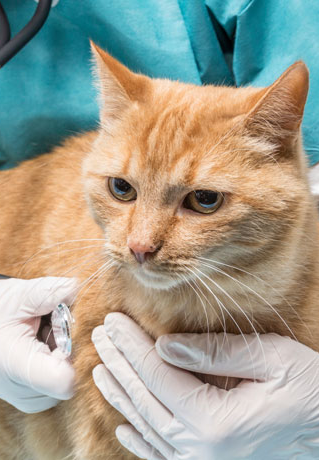 Nanu was a longstanding patient at Hastings Veterinary Hospital and was regularly seen due to his constipation and megacolon problem. 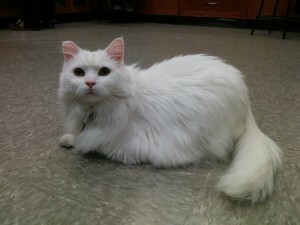 In January 2011, Nanu’s mom needed medical care and was unable to care for this lovely cat. Staff at Hastings Vet was already in love with him and his personality due to his stays at the hospital. While sad that Nanu would have to leave his home, everyone at the clinic was excited to adopt him when we were informed that he needed a new home. Since coming to the clinic Nanu warmed up to the clinic setting as if he has always lived here. For 3 ½ wonderful years, he split his time between scavenging food and hospital cat duties of being goofy and lovely to our staff members, patients, and clients. Nanu passed away in 2014 but will remain in our collective hearts forever!